The procedure, called focused ultrasound, allows doctors to perform brain surgery without cutting into the skull. 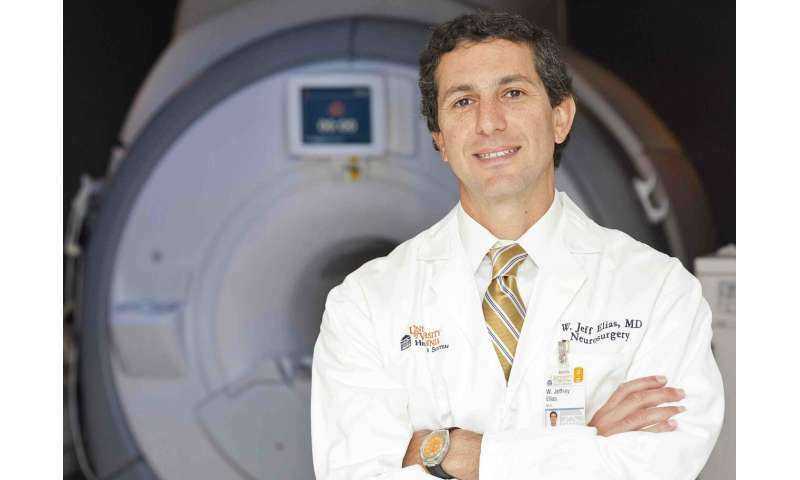 It was shown safe and effective for reducing medication-resistant Parkinson's tremor in clinical trials led by neurosurgeon Jeff Elias, MD, of the University of Virginia School of Medicine. "We are very excited about this approval," Elias said. "Now, patients with Parkinson's disease will have more options if their symptoms become refractory to medication." The focused ultrasound technology, manufactured by Insightec, directs sound waves though the skull and into the brain to generate a tiny hot spot, much like a magnifying glass focuses light. By heating tissue in this fashion, doctors can interrupt the faulty brain circuits that cause the uncontrollable shaking associated with Parkinson's. Magnetic-resonance imaging (MRI) lets the doctors monitor the location and intensity of the procedure in real time—an important safety feature before they make permanent changes to the brain. While focused ultrasound has been approved for the treatment of medication-resistant Parkinson's tremor, Elias continues to test the technology's potential for treating other symptoms of Parkinson's disease. In addition, researchers at UVA are evaluating the scalpel-free surgery's potential to treat many other conditions, including breast cancer, brain tumors, epilepsy and pain.